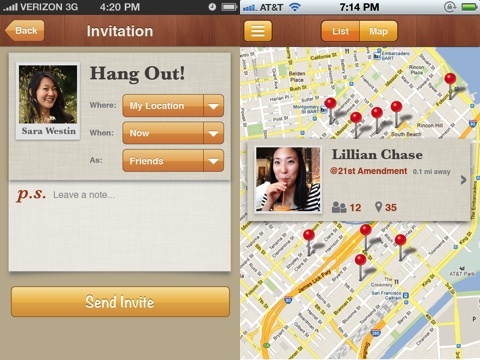 Kismet lets you know when your Facebook, Twitter, and iOS device contacts are nearby, so you can share face-to-face. As an iOS app trying to bridge your online social networking communication with your out and about, daily human interaction, Kismet uses simple, no frills interface to get you hooked up and engaging in real talk quickly and easily. Unlike Foursquare and Highlight’s bright visual presence and busy functionality, Kismet’s iPhone app is understated like your sweet, quiet wingman or wingwoman. The navigation is successfully accomplished with a sliding menu similar to Facebook’s iOS app. The options are clear and free of confusing icons and branding jargon–nearby, check in, hangouts, events, chats, favorites, invite friends, and settings. With a touch, you move to a simple screen with intuitive and direct interface to engage. If content needs to be filtered, then there are simple, one touch filter options at the top of the screen. If you need to create content or enter data, there are simple drop-down menus and rows with a pop-up keyboard where appropriate. The simplicity of the functionality and navigation makes it easier to use Kismet’s iOS app to maximize your time living life and communicating free of bouncing bits of information off servers and satellites. 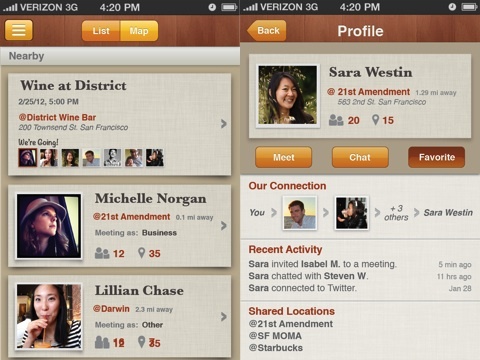 Kismet’s iPhone social networking app includes several excellent features. When you check in, there is a simple drop down to share your location, as well as a simple drop down to share the type of meeting–friends, business, or other. The one touch sharing to Facebook and Foursquare and the ability to import all of your previous check-ins from Facebook and Foursquare make switching to Kismet seamless. Kismet’s iOS app also figures out your home location. You can choose to hide from Kismet’s map when home by adjusting your settings. Kismet’s functionality works best when running in the background. You can make an adjustment in settings, if you want to preserve your battery and turn Kismet’s location services on and off. I didn’t notice a remarkable battery drain with Kismet’s location services activated. Kismet’s iPhone app is much less flashy than Foursquare and Highlight. Its clear focus on using location services to create real-life interactions with simplicity and ease is a welcome development. Kismet’s developers, Meh Labs Inc., understand less is sometimes much, much more. AppSafari review of Kismet was written by Jenni Ward on July 4th, 2012 and categorized under App Store, Dating, Free, Social. Page viewed 5445 times, 1 so far today. Need help on using these apps? Please read the Help Page.